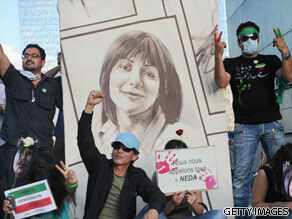 On June 2009, Iranian woman Neda Agha-Soltan was killed in the streets of Tehran during the Iranian election protests. Anthony Thomas is your Connector of the Day. Her death was captured on video by bystanders and within hours was broadcast on the internet, bringing global attention to the dissent surrounding the country's rigged elections. The 26-year-old became a symbol of freedom for the millions in Iran who want an end to the country's repressive state. The Iranian government responded with claims that Neda was alive and living in Greece, and then later, that she had been killed by the doctor who witnessed her death. Amid these stories, Iranian journalist Saeed Kamali Dehghan and award-winning British filmmaker Antony Thomas worked to tell the truth in what has become the acclaimed documentary, For Neda. The film was first released in June 2010 and includes intimate interviews that Saeed obtained at the risk of arrest with Neda's family. As we approach the second anniversary of Iran's Green Revolution, we talk to Saeed and Antony about the impact their documentary has had on keeping Neda's legacy alive.